For her I planned a special outing. She had her heart set on playing with her friend Eliza. But she also wanted to accept another friend's invitation to meet them at the Museum of Life and Science. She got the best of both worlds when Eliza's mom said that they'd take Rachel to the museum with them to meet the other family (and like ten others from our ward). Rachel had a great day! The rest of us hid out at home, with the promise of going to the museum once we're all feeling better (and while Rachel's at school) lifting the spirits of those feeling left out. For family night we discussed Remembrance Day and Veteran's Day and the roles our ancestors played in the First and Second World Wars. I printed out the draft cards for Karen's grandfathers, each of whom signed up for the draft during WWI. I can't remember if either of them fought...but Miriam thought it was neat that she shares a birthday with her great-great-grandpa Smithson and we counted the tale of great-great-grandpa Anderson's death (he was kicked by a horse and died a month before great-grandpa Anderson was born). Around 1940 Leo met Moralda (Molly) Nelson Burgess of Magrath. They were married 17 May 1941 in Lethbridge, Alberta. Their first home was on the Hancock dairy farm in Raymond and on 10 March 1942 they were blessed with their first son, Wayne Curtis Hancock. 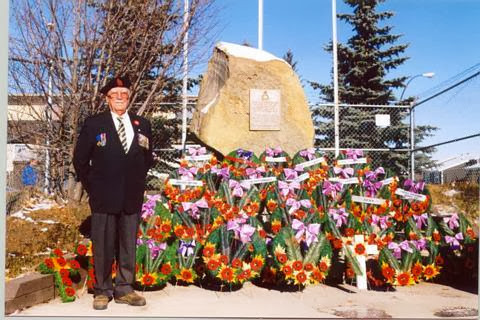 In the spring of 1942, after being rejected from enlistment in the Canadian Armed Forces several times, Leo traveled to Calgary to seek employment. He had heard the Canadian Pacific Railroad (CPR) was hiring mechanics at their Ogden train repair shop. During the interview Leo was told they were only hiring men with rejection slips from the armed forces. Leo had not brought his rejection slips with him and therefore was unable to obtain employment that day. During training Leo and Molly's first child, Wayne Curtis, fell sick and died of pneumonia on 11 May 1942. Unfortunately, Leo was unable to attend his funeral service as military training did not allow it as he was scheduled to ship out to England. In my grandmother's history, my aunt notes that "Leo landed on Juno Beach in Normandy, France on D-Day, June 6th, 1944, and was at Caen, France, when it was capture from the Germans. He was also at the battle of the Falaise Gap and was in Ghent, Belgium and fought into Holland." He returned home to Canada in January 1946, and had four more children with Molly. Unfortunately, after retirement, Molly and Leo divorced. My mom said that Aunt Molly had a terrible time dealing with the death of Wayne and Leo's deployment and that after Uncle Leo came home from the war they simply never quite got along as they used to. Uncle Leo didn't like to talk about his time in the war. It really shook his faith in God. I remember him once saying that he didn't even desire to ever go back to Europe but "in the spring of 1999, Leo had the opportunity to return to Europe to celebrate the 55th anniversary of D-day and the invasion of France. The trip was sponsored by the Canadian Veterans Affairs Department. The opportunity was a very gratifying experience for Leo and one for which he will always be thankful." With the 50% casualty rate at Juno Beach on D-day, I suppose we should be extra grateful we got to have Uncle Leo around as long as we did. He passed away in June 2002. Well, it may have been gratifying, but he still didn't like to talk about it. At all. The war was a horrible, horrible thing. As all wars are. And get well soon, all you sickies! Sickness can be pretty horrible, too. I enjoyed reading some of your family history. We were in Ghent, Belgium on Saturday so it was neat seeing it here. Wish we could have gone to Normandy! One day soon you need to ask Mary for the details of her dad's military service. Uncle George also served in WWII, with I think the Scottish Highlanders or the Canadian Scottish Regiment or something like that. I know that, even though he died in the US, there were Canadian Scottish pipers to play the military salute at his grave site.